Dr. Shane Wood, Professor of New Testament Studies and the Associate Academic Dean at Ozark Christian College was a special guest at ACU, February 10-11. Dr. Wood recently authored, Between Two Trees (ACU Press) – a book that challenges us to cling to hope, love, and life even while we are in the middle of struggle and conflict. 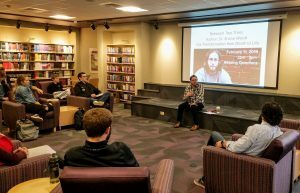 While on campus, Wood spoke at chapel, the Library Reading Commons, and Adams Center regarding new perspectives on old questions about faith, life, sin, death and God. He shared insights about his new book, and bridging the gap between who we are and who we long to be. Between Two Trees was released this Spring by Leafwood Publishers and is available at Christian bookstores around the nation and all major distributors.